The company’s profits have plummeted after increasing controversy over treatment of animals in the theme park. The parks feature whales and other sea life performing shows and tricks in front of an onlooking audience. However, the realisation that the welfare of the animals doesn’t seem to be at the forefront of SeaWorld’s business plan has put customers off visiting the parks. Over the past year, the company’s net income has decreased by 85 per cent to $5.8million in the three months to the end of June 2015, down from $37.4million in the same period in 2014. This has followed the release of a documentary called Blackfish, that claims the whales that are kept in the park live in cramped conditions, causing them to act aggressively towards their trainers. 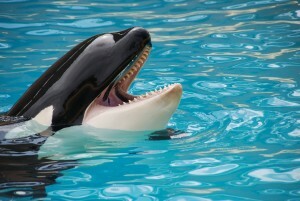 Joel Manby, the boss of SeaWorld, described the loss of visitors as “brand challenges”. To boost visitor numbers, the park slashed its ticket prices and embarked on a marketing campaign with the aim of improving its image. But neither have worked very well so far. SeaWorld hopes that new roller coasters will encourage more people to return to the park. Amidst all of this, an image has recently gone viral on social media that highlights the cramped conditions the whales live in. “We realise we have much work ahead of us to recover more of our attendance base, increase revenue and improve our performance as returning to historical performance levels will take time and investment. “To address some of our competitive challenges in Florida, we have adjusted our attraction plans with the announcement of two new significant coaster additions for 2016. Read and comment on the original Express article. Minimum wage increase – How will it affect your business?